I'ts true! This is what they posted on Facebook this morning. 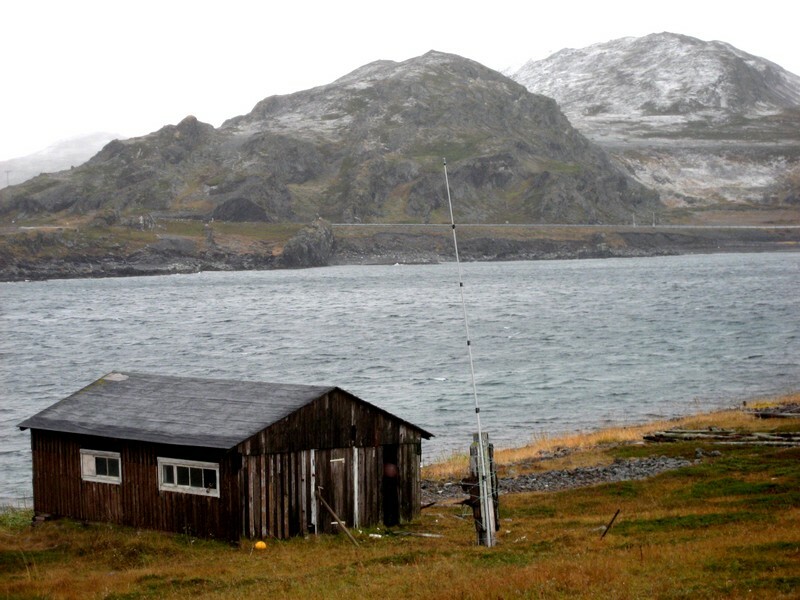 WGBW Denmark WI 1590 was heard with a fair signal during KONG22, and Mark Heller, one of the most DX friendly stations owners around, swiftly confirmed my report. At 1100 UTC today, a very rare station was audible over CBR Calgary on 1010. OJ Sagdahl alerted me, and I was able to pick up the TOH ID from KXXT Tolleson AZ. 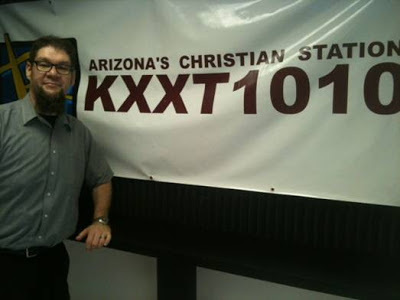 Arizona stations aren't often heard, so this was a great surprise. A swift response as well, from the station's PD who sent a photo of himself as well. The last 24 hours of KONG22 experienced excellent solar conditions, except perhaps the solar wind a bit on the high side, but DX-ing was challenging. Not much (any) of interest from Asia and the Pacific. As usual, the last evening's dinner is reindeer tenderloins, to which we enjoyed a truly superb red wine from New Zealand, a 2009 Felton Road Pinot Noir. Conditions throughout the last night was mostly towards the eastern part of North America, and South America. Buenos Aires-1350 and WMOB-1360 were noted in passing. Possibly the morning's most interesting log was made close to the last full-hour before packing our gear: WBIP Booneville MS 1400. OJ, TJ and I drove to Vadsø at 10:00 local (Ole had left for Andøya an hour earlier), and despite stretches of extremely icy roads (I occasionally felt like Bambi on the ice when driving), OJ and TJ arrived at Vadsø airport with time to spare. On the second last morning, North American stations were heard with good signal levels. Some examples: KTRF Thief River Falls MN 1230, KWIX Moberly MO 1230, KEYS Corpus Christi TX 1440 and WGBW Denmark WI 1590. Yesterday had a fair opening towards Japan on the 1320 UTC NHK-2 ID spot, with 500-watt JORC heard on 1467 with the ID from JOTC 1521. The latter was possibly also heard. 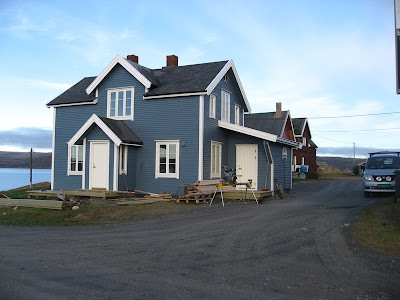 Yesterday also saw the annual KONG dinner at Kongsfjord Guest House. While there, the weather took a definitive turn for the worse, and we're now experiencing gale force winds, rain and sleet and +2 Celsius. The sleet occasionally induce static noise to the antennas, but mostly they're behaving fine. The picture was taken at 1030 local (0830 UTC). The 50 degree beverage is exceptionally quiet, so we're hoping for Pacific stations around noon. View from the window - not very tempting to walk outside. The MiniWhip is mounted on the fiber glass rod. Another extremely quiet day with only the dominant stations audible. So instead of an extensive log of what we heard, here are a few more pictures from yesterday. Still clear skies and below freezing, but the forecast for later today is cloudy, increasing wind and rain. 50-degrees beverage, as seen from the transmitter's end. Using 150 cm fiber glass rods as supports. Sunny, calm and clear skies on Thursday morning - but quite cold as well, -2 Celsius. 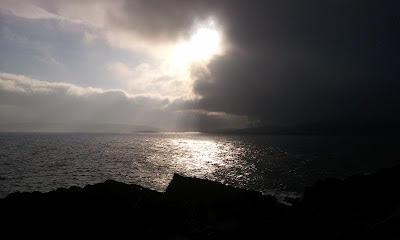 Here are a few pictures when I was out for an hour's walk. If 5:28 is to be considered "morning"... Geomagnetic activity has been quite low the last 24 hours, which should give us fair conditions towards North America, Asia and the Pacific. Instead, conditions have been very much on the dull side all Wednesday. For the first time on KONG22, there was no trace of Marshall Islands and Kiribati, and Japan was mostly absent. Plenty of time to check recordings, email, facebook, or whatever else needed a check. I had plenty of time to send off a reception report for the 1512 kHz Koriyama relay of JOFD NHK-2 Fukushima, and received a friendly and very detailed email response this morning. For dinner we started off with pan-fried fresh dates, wrapped in bacon. Very nice combination of salt and sweet. Main course was rack of lamb with herbs, garlic and Dijon mustard served with Bjarne's herb-mashed potatoes. With this we had a Chateauneuf-de-Pape from Clos des Brusquiéres 2006. For dessert we had another sweet & salt combo - half-baked chocolate-amaretto-espresso cake with smoked Maldon sea salt flakes on top served with Mas Amiel. Yummm! Yesterday morning, the ionosphere finally settled enough or us to receive more than a handful of stations from North America. The best period was around 0500 UTC with many signals from the western part of the continent such as KELA-1470 and KBZY-1490. Pacific later in the morning and noon was rather disappointing, with only Marshall Islands and Kiribati surfacing. It wasn't until early afternoon we had decent signals from Japan. At that time of the day, the inferference from China is usually severe. Yesterday was another king crab day, this time with focaccia and Siberian chive olive oil, and chocolate-lime soufflé for dessert. Weather's been quite nice the past two days, partly couldy and mostly dry. Temperatures in the 3-6 degrees Celsius range. Conditions this night/morning were reasonably good. Right now around local sunrise (7.30 am) the signals usually take a dip before getting stronger again later in the morning. Hoping to hear some early Pacific/Asia today. Ahhh.... finally fair conditions towards North America! Still very disturbed conditions, but one or two stations did manage to get through, such as KWYO 1410 which OJ Sagdahl heard last night. Very weak conditions throughout the morning, but Marshall Islands and Kiribiti were audible. Early in the afternoon we experienced very nice condtions to Japan with a nice ID from JOFD Fukushima relay station in Koriyama on 1512. Thanks Takashi Kuroda for confirming the JOFD identification. Some Australian stations were heard in early evening. Dinner today was burned figs with parma ham , followed by woked salmon as main course. Cheese, chocolate pudding and vanilla custard for dessert. Wines: Chardonnay Les Graviers 2010 with the main course, and Luxardo Amaretto with the dessert. Windy and rainy today, 5 degrees Celsius. The solar conditions appear to be a little more quiet now. Quiet night - at least on the TOH recordings I made. Now at around 06:30 local there are a few signals from North America. We'll have to wait and see what it evolves to.KMIK-AZ 1580 seems to be having transmitter or antenna trouble as it is suddenly one of the most common stations here. Cloudy but mostly dry, light breeze and 4 degrees Celsius in the morning. The forecast for the afternoon is less promising. Most of the day was extremely uneventful, with only a few and weak signals from Alaska and Hawaii, plus Marshall Islands-1089 and Kiribati-1440. Towards the afternoon, things started to improve with better audio from Asia. 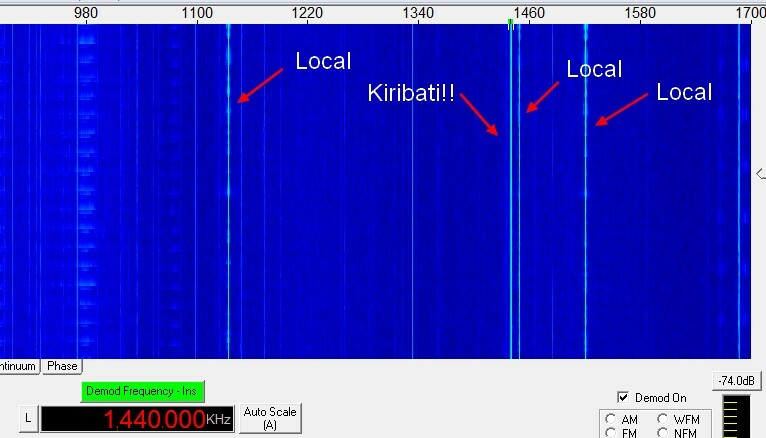 Excellent signals from Japan from 13:00 onwards, and more than 20 stations from India were logged at 15:30 on the backlobe of the 310 beverage. Maybe there is hope for the coming night. Today's dinner was quite traditional, first Salmon Sashimi with Sake (to celebrate the excellent Japan signals), followed by King Crab Carbonara. Assorted cheese (with my favourite Papillon Roquefort) for dessert. Weather's been quite ok with decreasing winds, mostly dry in the afternoon (so I could enjoy a nice jog to the lighthouse), and around 5 degrees Celsius. OK, so we didn't hear much yesterday, but we did find out about the 1610 TIS, as it turned out to be WQLE259 in Prudhoe Bay, AK. 10 watts according to the FCC. Being somewhat (or totally) ignorant that it had been heard in Aihikiemi last year, we posted a query to the RealDX reflector and eventually found out what it was. It's only 10 watts, and was heard yesterday at all three on-going Arctic DX-peditions (Kongsfjord, Aihkiniemi and Parkalompolo). 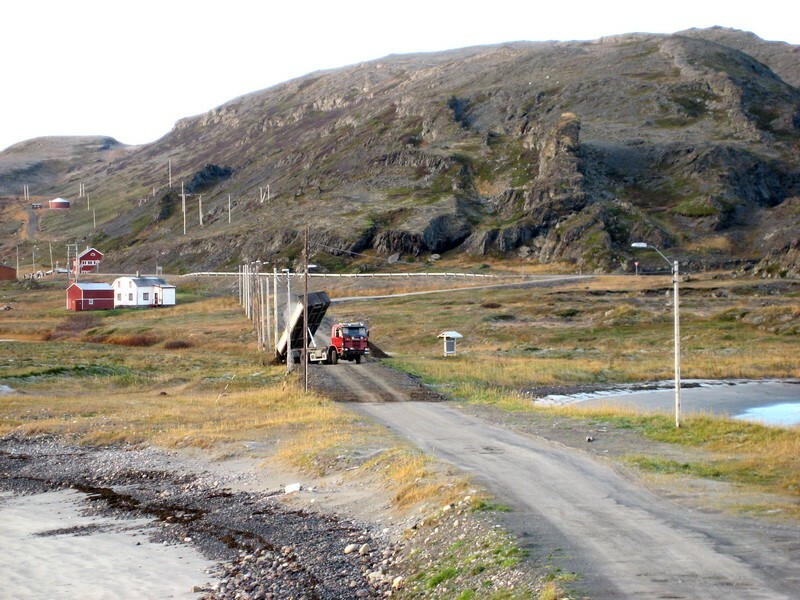 Also noted from recordings was 40-watt CBC Tuktoyaktuk alone on 1150. Conditions towards Asia later that day was uninspiring. More inspiring was social activities like having reindeer stew for dinner. Reindeer stew is thin reindeer shavings, red chili and mashed potatoes, accompanied by a bottle of 2006 Weinert Carrascal red wine. For dessert we had chocolate pudding with vanilla custard, a small glass of Grappa Amoroso and a small glass of Amaretto. The geomagnetic conditions are awful with a C-flare early in the night, but some signals manage to sneak over the North Pole. Our expectations for today are modest: Keep the proton level down! Ole Forr arrived yesterday evening, and after a very uneventful night we woke up to some Alaska, Hawaii and west coast stations. Conditions are brittle though - going very much up & down with the changing ionosphere. Stations are popping up from the noise with nice levels for a few seconds, then they dive into the noise again. The most stable station this morning appears to be KZDG San Francisco CA 1550 with its Indian format. Other stations noted are KLAM Cordova AK 1450 with very nice levels, and KXXJ Juneau AK 1330. 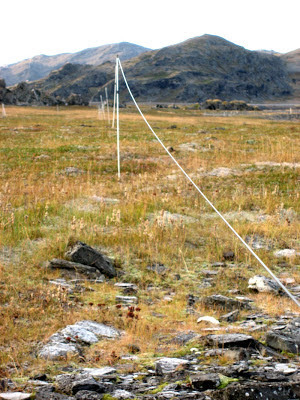 OJ Sagdahl and TJ Bråtveit are scheduled to land at Berlevåg airport at 13:17 local. UPDATE: KMIK Tempe AZ 1580 somewhat surprising log at 07:00 and 40-watt CBKD weak under KKAA an hour later. Also at 07:00 a readable TIS station on 1610 which will be uploaded for expert scrutiny (thanks PAX crew for the tip). At the moment Marshall Isl-1098 is heard with a weak signal. Arrived at Kongsfjord at 12:15 local, in gale force winds, blowing rain and +5 Celsius. A bit later I drove to Berlevåg to collect 10 kgs of king crab. On the return to Kongsfjord I took the pictures below. The waves were huge! Ole Forr is scheduled to arrive late this evening or early night, after a 2000+ km drive! The rest of the gang will be picked up at BVG airport tomorrow. UPDATE: The 15:00 UTC full hour brought mostly south-east Asian stations, including a few from the Philippines with nice signals. Conditions were mostly absent on Sunday morning, so I decided to make an early return to Vadsø. An SMS from Mika confirmed that conditions towards Asia later that day weren't very exciting. 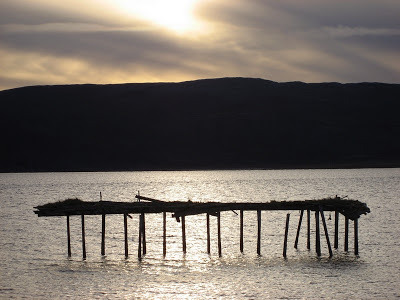 I'm going back to Kongsfjord Friday afternoon. A very nice start actually, as at 1100 UTC most frequencies housing Japan's broadcasters were speaking Japanese, and I also noted some interesting stations from China, such as Nei Menggu RGD on 1584. I was just waiting for New Zealand to become audible, when suddenly someone cut the antenna. Or someone hadn't but it sounded like that. Dead quiet, except my semi-local Russians. When conditions slowy recovered a few hours later it was typically auroral with Iran dominating almost every frequency they're listed on. One's been uploaded and is available in the Audio Files section. 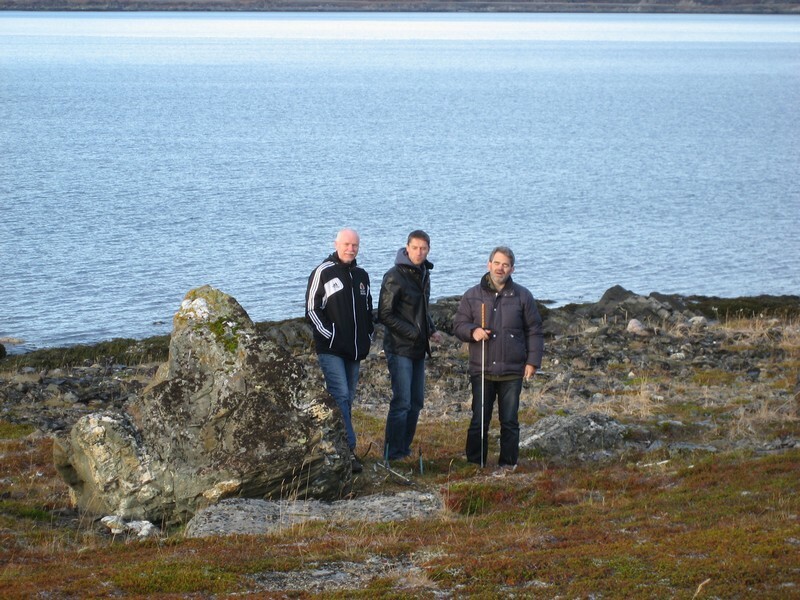 Before the DX started I made a brief trip to Berlevåg to see old aquaintances. On the way back I took the picture below. My QTH is just where the sun focuses its rays. Incidentally, maybe. We'll see what the night brings. I'm in contact with Mika Mäkeläinen in Aihkiniemi via SMS, comprising the Arctic Early Warning Radio Alarm System. Or something to that effect. Not much to report, really. The plasma blob on the sun yesterday certainly had its impact and conditions went quite auroral with few if any North American stations audible. Some stations from Brazil and Argentina had ok signal levels but nothing really "DX-able". Instead I did some more comparisons between the omnidirectional Mini-Whip active antenna and my directive beverages. This time I had connected a Kiwa 10 dB preamp to the Mini-Whip feedline to put the antennas on equal terms with regard to gain. The Mini-Whip fares quite well when signals are above a certain level. Weak but audible X-band stations, such as AM Restauración, Argentina on 1630 isn't heard on the Mini-Whip, while the 50-degree beverage backlobe hears it quite well. When it comes to monitoring more powerful stations in-band, the difference is much less pronounced. This 20-second recording of Buenos Aires on 1270 should illustrate my point. The first 10 seconds is from the Mini-Whip, the last 10 from the 50-degree beverage (pardon the unintended difference in audio gain). While the latter is definitely stronger, the Mini-Whip does a very decent job. Add to the equation that the NetSDR which hosted the Mini-Whip is a few dB less sensitive than the Afedri SDR-Net which was connected to the beverage. I experienced roughly the same difference when I compared with Brazil 4885 kHz. During the day I will ground the Mini Whip feed line to see if there is any difference in noise levels. UPDATE: After grounding the coax braid, there was no difference. The SDR-Radio waterfall was identical before and after the grounding, so I presume that the noise level is as good as it gets. Misty but relatively calm, 8 degrees Celsius at 7 am local, this is in the "Warm" category for October and 71 degrees north. Some time ago I published some sensitivity measurements from receivers I have owned or borrowed. It's been a while since the last update, but here it is. Although I have used the Mini-Whip before, this is the first time I've erected it properly, and made a systematic test and comparison with my other antennas. I decided to mount the Mini-Whip to a 21-ft telescoping fiber glass mast from Max-Gain. The mast costs a lot more than the antenna, but is extremely robust. The elements are hollow, allowing the feed line to run inside the mast. I secured the antenna with Coax-Seal at the top. 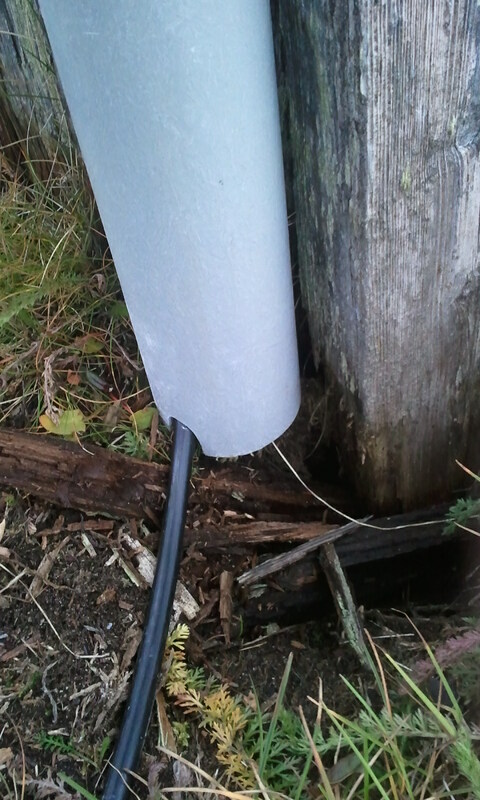 Of course, the fiber glass mast needs a support, so I basically used what was at hand. Identical masts have been in use for two winters in the QDFA array, and I don't expect it to collapse or break. 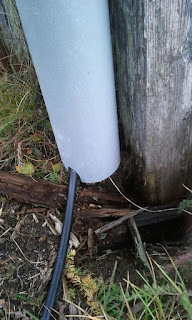 At the bottom of the mast I made extra room for the feedline to avoid stress and potential damage. On to the tests! Comparing a small, unidirectional active antenna with directive beverages from 225 to 500 meters long is a bit like comparing a family sedan with a racing car - and half expecting the former to win. And just so it's said: On Shortwave the Mini-Whip outperformed all my other antennas with a comfortable margin. But what about Mediumwave? The first test array was comparing signal levels on the groundwave stations audible here. I compared the Mini-Whip with the QDFA phased array, and the 310 degrees beverage (225 meters). 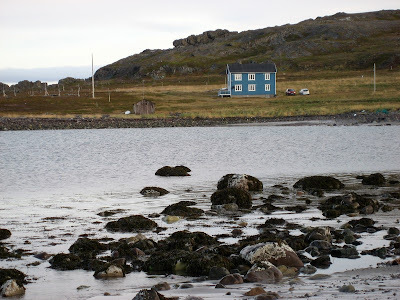 The stations were: 153 kHz NRK Ingøy, 399 kHz NDB "BV", 657 kHz Radio Rossii Murmansk, 675 kHz NRK Røst, 1134 kHz Radio Mayak Murmansk, 1449 kHz Radio Mayak Monchegorsk and 1521 kHz Radio Mayak Zapolyarny. 10-20 dB behind the 310 isn't bad at all, and almost equal levels with the QDFA at times. I did expect it to fare better on LW though, given its reputation as an excellent antenna for NDB hunting. One important factor I have missed in this test however is that the other antennas have preamps in front, while the Mini-Whip has none (except the one in the Power Feed Unit). Because of this, I did a quick measurement of each antenna's noise floor at current conditions. The Mini-Whip measured -112 dBm (1200 kHz, daylight), while the beverages were around -118 dBm. All measurements were done with the G33DDC Excalibur Pro. Skywave tests have been postponed to a later weekend. This doesn't look too promising. In fact, the MW was all Arabic and Farsi this evening - with a couple of exceptions, like this one from Down Under. We'll see what happens during the night and tomorrow morning. Last night's DX - or should I say this morning's DX - was uneventful. Only the usual stations were heard during the one full hour I recorded, and the level of European stations were surprisingly high so a lot of frequencies were pested with noise. Iowa/North Dakota/Wisconsin stations were dominating, indicative of disturbed propagation. Exceptional rain fall last night after an exceptionally mild September day - up to 13 Celsius. Still nice and mild with 9 Celsius, and dry. Weekend DX - And How Does The Afedri SDR-net Cope? 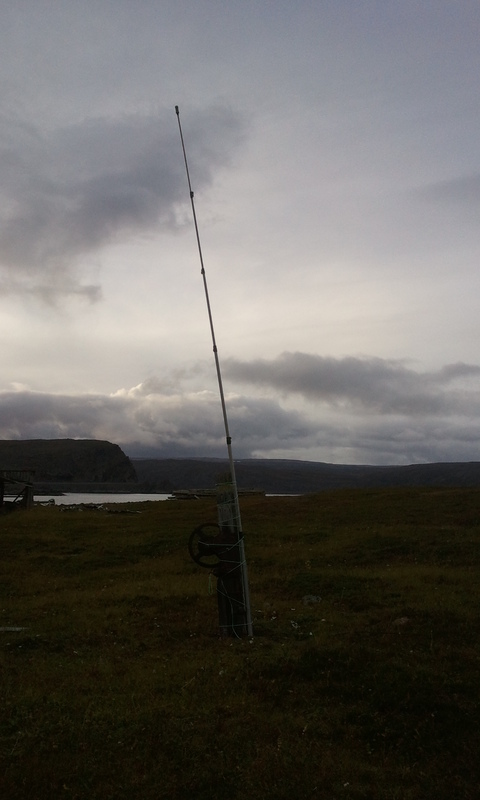 I drove to Kongsfjord Friday afternoon to do further tests of the 340 (alas, jury's still out and I don't know when it will return - if at all), and do some DX. Australia's been going quite well for several days, however for some reason only South Australia. The rest of the country is mostly absent, even the most common of them all, 4QD-1548. X-band has been exceptionally quiet. Radio National 729 and 5AN 891, both in Adelaide, have had very nice signals, such as this one recorded at 17:30 UTC on 729 kHz. It was recorded off the Afedri SDR-net. Conditions towards North America last night were mediocre, but enough to make a comparison of the dual 340 beverage, compared to two single 340's. A dual beverage has definitely more gain than a single one - average measurements suggests 5-6 dB or one S-unit. But it is more susceptible to Loran C noise too, and the F/B ratio has not been improved. It was impossible to measure if the front lobe had become narrower, which is basically the idea behind the dual beverage. Some time ago I promised to get back to the Afedri SDR-net's capacity as a MW DX receiver. Could it really stack up with the much more expensive SDRs like the G33DDC, Perseus and NetSDR? Well yes it can. If I pay a bit attention to its somewhat fragile front-end, and reduce the VGA gain when necessary, there isn't much the other SDRs can do that the Afedri can't. It's a keeper. It has been appointed official DU hunter, and is connected to the 500 meter 50 degrees beverage. I'm writing this Saturday evening, hoping to hear some North Americans tomorrow morning. Next weekend will see the inauguration of Bakker's MINI-whip to the MAX-Gain (21 ft) mast which was ordered a few days ago. While waiting, I'm enjoying "Luftgitar" (Air Guitar in English), a rock program on RAS-2 - via satellite of course. 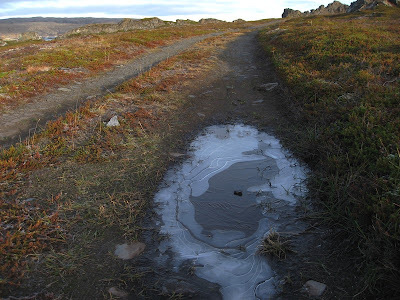 Sunday was typical autumn - brisk winds and showers, and temperatures around 6-7 Celsius. Luckily, most of our outdoor work was done by then. Testing the dual parallel beverage wasn't easy. We needed signals from many directions to be able to determine if it had other - and hopefully better - properties than a standard beverage. Stable MW signals are mostly only found to the southeast (Kola peninsula), so we settled for a suite of NDBs in the 300-400 kHz range. The tests were inconclusive. We understand that in order for a dual parallel beverage to work properly, the two beverages need to be identical. Terrain conditions prevented this. More surprising though, is that the eastern leg provided significantly better gain than the western leg, from 2 dB up to around 5 dB. So in electrical terms, they weren't identical. The two connected together via the DX Engineering Combiner did add 5-6 dB of gain over the single eastern beverage. Unfortunately, this level of gain also a substantial increase in broadband Loran C noise. This seems to be the limiting factor, despite using a 75 dB 100 kHz notch filter and a high pass filter for protection. I will continue testing the 340 dual parallel beverage next weekend, weather permitting, hopefully with skywave signals. We will then find out if we will keep the dual beverage (not very likely), or which of the eastern or western single beverages will be kept. 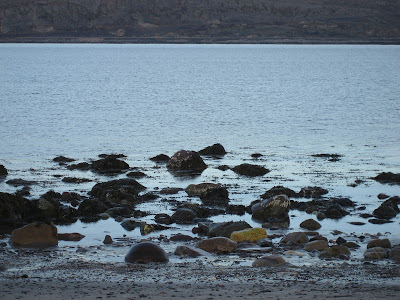 We drove to Vadsø in the afternoon. The weekend's last dinner was woked fillets of chicken with leak, paprika, red chili and jasmine rice with curry. Lotsa curry. The remaining wine bottle from the weekend was a 2008 Rossodiverzella. Very good. For dessert: Mövenpick vanilla ice cream with chocolate syrup or raspberry sauce. Conditions improved during Sunday, and in the evening OJ logged two most wanted Australians on 729 and 891 kHz on the 50 degrees beverage. Saturday was relatively calm, cloudy most of the day but sunny and nice towards the afternoon. The dual, parallel 340 degree beverage was finally completed, and briefly tested. The QDFA refurb was completed as well, and performed to specs when we tested it. 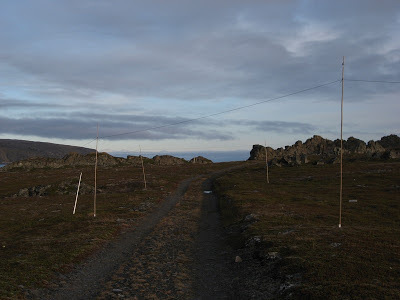 This is what we did: First we connected loop no 1 directly to the feed line while monitoring two groundwave stations from Murmansk; 657 and 1134. Those stations are located at 142 degrees, or roughly South-East of here. Although not in the QDFA's deepest null, the loop should attenuate their signals somewhat. After testing loop no 1 we removed it and connected loop no 2 etc. When we had recorded the signal levels for each individual loop, we connected all loops to the phaser and feed line. The individual loops received 657 kHz at an average level of -70.7 dBm (ranging from -69.3 to -72.4). The QDFA received 657 at -88 dBm, giving roughly 17 dB of attenuation. 1134 kHz levels were - 85.6 dBm in average, ranging from -83 to -87.5. The QDFA level was -94 dBm, or 8.4 dBm attenuation. We are quite satisfied with this. It should be mentioned too, that the phaser box escaped the previous, rather harsh winter, unscathed. Everything appears to be working, thanks to the continuing modification work carried out by Dallas Lankford. It now appears to have passed the weather test of one of the worst habitable winter climates of the world. It is also worth mentioning that the fiber glass masts from Max-Gain are exceptionally robust. Our backs were aching after two challenging days on the antenna field, but in the evening we could finally enjoy reindeer sirloins with mashed potatoes and woked leak, red onions, red chili and (red) tomatoes. A most delicious Australian red wine was enjoyed with the meat, 2010 Miss Harry bought in Finland (and recommended by Antti Altonen). It's in fact not available in Norway. Dessert: Jelly with artificial strawberry taste, and (real) vanilla custard. Friday was a bit windy but dry and even a bit of sun, so all in all a nice day for antenna maintenance. The QDFA was in need a total refurbishment, except the superb Max-Gain supports. New antenna wires were fitted, resistors replaced, transformers reworked and feed lines repaired. The feed lines will be set up today, allowing us to test the QDFA with a fresh battery. The dual, parallel 340 degree beverage feed line system was built, including transformers, isolators and a combiner, including grounding. The western part of the beverage was set up yesterday, the eastern part will be erected today. We also erected the "old" 310 degree beverage. It apparently works very well indeed, since with the current auroral conditions stations from the Middle East were very strong to its back lobe. After 8 hours more or less outdoor, walking, lifting and carrying (heavy loads) most of the time, we were quite exhausted in the evening. We did have enough energy though to make ourselves woked salmon with carbonara. We enjoyed Calles Riesling with the salmon, and we even found a bottle of port wine left over from last year's KONG21. No transatlantic signals during the night. OJ Sagdahl arrived to Vadso by plane on Thursday, and we drove the 170 km to Kongsfjord in the afternoon in rainy and windy conditions. Our goal is to get all or most of the antennas out, including the new dual parallel 340 degrees phased beverage. The 50 degrees beverage was erected last weekend and is the only one up at the moment. Some Japanese stations were heard in the afternoon, but all of a sudden everything disappeared - the ionosphere is obviously still "shaken" after the CME and proton event a few days ago. Later in the evening we heard a few Filipinos. Prior to and half an hour after sunrise this Friday morning, South America had decent signals on the back lobe of the 50 degrees beverage. Mostly Brazil, and a few from Argentina and Uruguay. Such as Radio Monte Carlo, Montevideo on 930. As usual when DX-ers come together in Kongsfjord, good food is prepared and good wine is consumed. Thursday evening we put together a reindeer stew, comprised of thin reindeer shavings, red onion, red chili and mashed potatoes. A 2006 Weinert Carrascal proved to be a superb companion. We had chocolate pudding with vanilla custard for dessert, and we finished off with a glass of Disaronno. Or maybe two. All the SDR software packages supporting the Afedri SDR-net can do RF recordings, and to a varying degree scheduling is possible too. But if the main purpose is recording and not live listening, you might find yourself wanting just a simple recorder. Well, the Perseus SDR has its Mestor, and now the Afedri SDR-net has its Afedrec! It was developed by Vasiliy Gokoyev and made available through the Afedri SDR-net Yahoo reflector. Afedrec is a character based application, and at that it takes some time to put all the parameters in (and to avoid the syntax errors). Looking for a way to make a one-click recording, I turned to my old friend System Scheduler which had proved to be a very reliable application for doing G31DDC scheduled recordings. Afedrec in the CMD window. Each dot represents 10 MB of data. This turned out to be a very good idea indeed. Programming System Scheduler to make recordings of various lengths (or various center frequencies or various sample rates) is quite straightforward. When I open System Scheduler, I can select the recording I want to make, and select the Play button. Of course, I can also set up automated scheduled recordings. When Afedrec is recording, you can play back previous recordings with Spectravue. Apparently this is not possible with SDR-Radio, because it holds a UDP socket open and by default the second connection is not allowed. Afedrec is extremely gentle on the CPU. On my i5-2310 2.9 GHz system, the CPU load when running at 1333 kHz sample rate is 1 % or less, while SDR-Radio and Spectravue both use around 7 % CPU. Afedrec recordings can be played back on SDR-Radio, Spectravue, Winrad and HDSDR. If you want to do scheduled recordings with the Afedri SDR-net, or a one-off recording without monitoring (for instance a full hour recording), the Afedrec/System Scheduler combination is hard to beat. 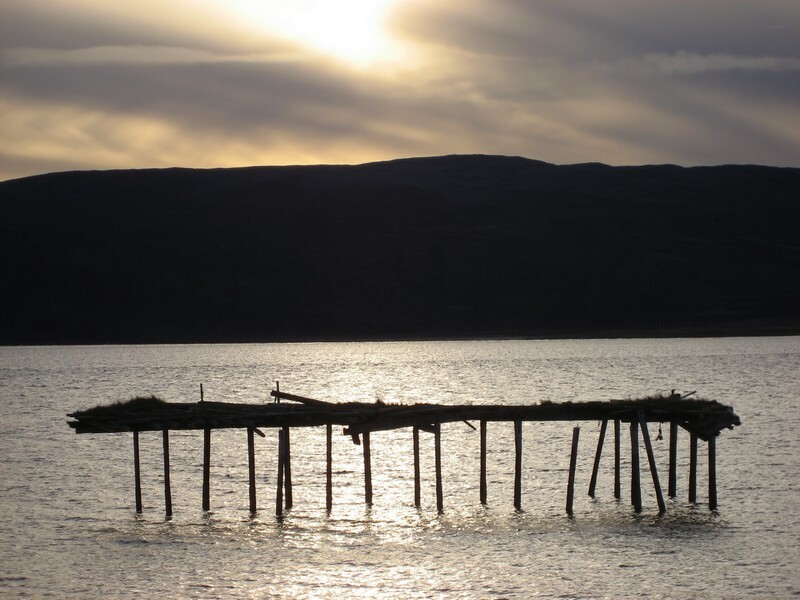 With the second weekend without the midnight sun, evenings are already becoming darker. Although it will still be three weeks until we can expect to hear any DX, preparations start early. We are always experimenting with new antennas. This year we will test a replacement to the 340-degree beverage, namely a staggered beverage in roughly the same direction. Otherwise, the antenna farm will not change much. Most of the time was spent indoor though, painting walls that haven't seen new paint since the mid-70's. 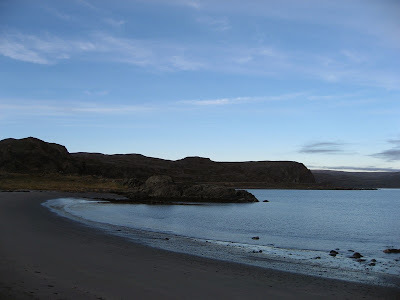 The photos below were taken just after sunset on Friday. It is the northern side of the Veines peninsula. 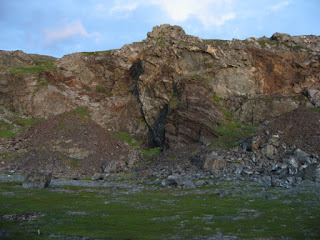 This is quickly eroding (in geological perspective) sand stone. Getting away from man-made noise has become increasingly important for DX-ers - and increasingly difficult. 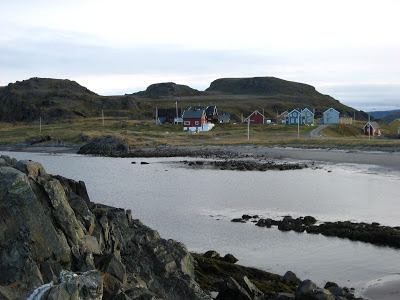 Going to the seaside or into the mountains can provide excellent opportunities for DX. But you need power! A laptop can last a night if one brings along an extra battery. However, feeding a 5V SDR from the laptop will either not work at all (too much current load), or it will drain the laptop's battery rather fast. Battery packs have been around for a while. Some of them are quite powerful. 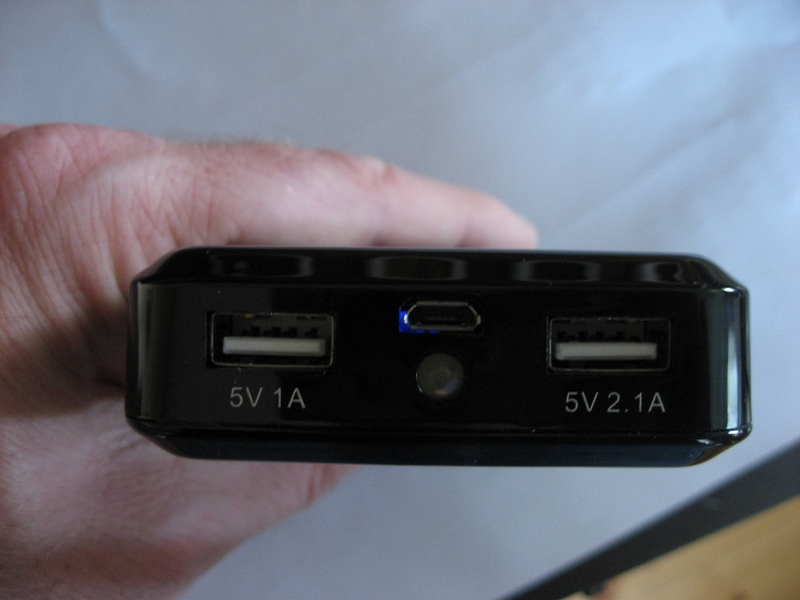 After a quick search on Ebay I ordered a 11200 mAh battery pack which has two 5V outputs, rated at 1A and 2.1A. It came with a variety of adapters and connectors so one should have no problems to charge any mobile phone on the market today. 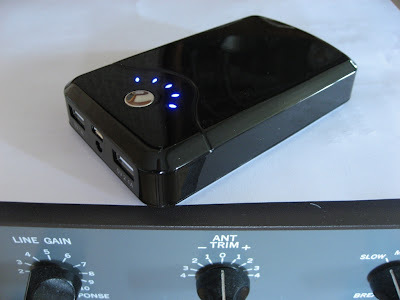 But the battery pack can do more than to give extra juice to demanding smartphones. The one I bought can power two SDRs! The Perseus draws around 750 mA while the Afedri has a modest 390 mA demand. At least in theory, this battery pack will power the Perseus almost 15 hours, and the Afedri almost 29 hours. I don't know how much current is necessary to run the NetSDR - probably a bit more than the Perseus but less than 1A since I could feed all three of my 5V SDRs from the 1A output. Before connecting the battery pack to my SDRs I checked the voltage of the DC outputs. I was somewhat surprised to see that they weren't quite the same. The 2.1A output measured 4.95V which is very good, while the 1A output measured 5.35V. That's a bit on the high side. Although all three SDRs worked with 5.35V when I tested them, I have decided not to push my luck. I'll stick to the 2.1A, 4.95V output. Otherwise, the battery pack is a nice looking, small and light device. The enclosure had FCC and CE logos on it, hopefully for a reason, and the price was USD 40 including air mail shipping from China. And they've even built a LED torch light into it. So you can search for the car keys you dropped when you erected the antenna. I let the battery pack feed the Perseus for most of yesterday, until only the last of the indicator LEDs were lit. How much juice was left I don't know. I was expecting (or fearing) that voltage would drop as the battery drained. However, the voltage reading of the 1A output was identical (4.95V) to the voltage when the battery was fully charged. So apparently, the battery is able to keep voltage stable for a very long time. Thank you Takashi Kuroda for making me aware of these devices. Afedri SDR-Net - Better Than Anticipated? 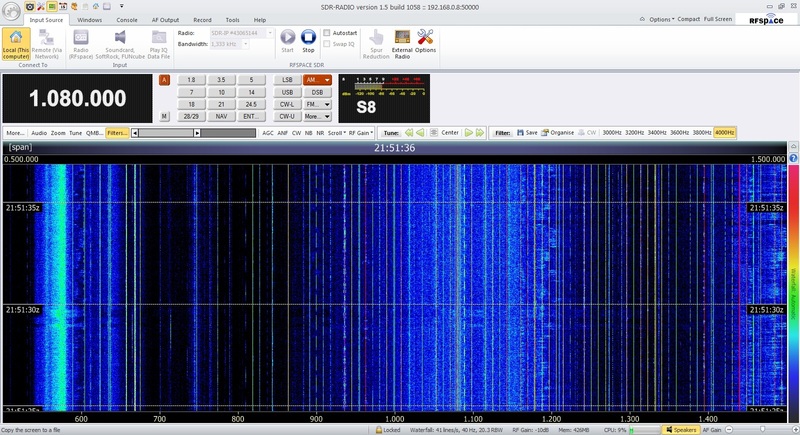 The screendump below is from the 31 meter band with rather high signal levels. I am running the Afedri at +24 dB VGA, which equals around -104 dBm sensitivity. At this VGA setting it's in fact a tad more sensitive than the NetSDR, yet there is no indication on the waterfalls of any overload. Very cool. This may indicate that the Afedri will perform well during the coming autumn's MW openings. Earlier today I also did a recording test, with both SDRs recording 1250 kHz into an internal hard drive simultaneously. No hiccups or stuttering, and very low CPU. Maybe the Ethernet connection makes it easier for the CPU and that the network board does some or most of the processing. I don't know, but what I do know is that when you record from USB based SDRs stuttering may often be a problem. If you have a router or a switch, you can connect several net-based SDRs to one PC. 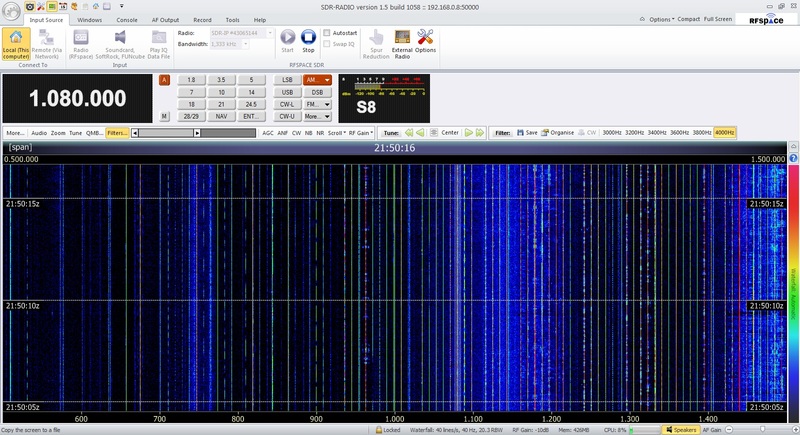 And if you use SDR-Radio, which allows multiple instances of the program to run, you can operate them simultaneously. Since I have one RF Space NetSDR and one Afedri SDR-net I decided to test this. What is needed are different IP addresses for both (or all) SDRs, and different ports. I am no network geek so I had my portion of trial and error, but with the help of SdrNetSetup and disconnecting and reconnecting the Afedri I got both SDRs to play along. On the jpg below the Afedri identifies as "SDR-IP". Both SDRs are displaying a 1250 kHz span, with little CPU load. Another interesting observation is that when the SDRs are tuned to the same frequency, their audio appear to be perfectly synchronized. There is not the slightest trace of echo or other audio artifacts. Diversity reception, anyone? I had some time this weekend to check into the Afedri SDR-net further. My beverages and the QDFA are all down, so I used one of the QDFA loops (7 m high and 20 m wide) as a temporary ALA-100 loop. It has quite a bit of gain especially on the SW bands. 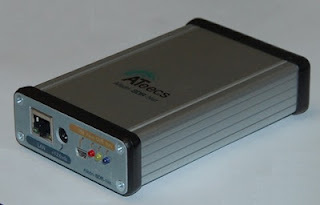 The Afedri SDR-net sports a 12-bit, 80 MHz ADC, in contrast to the Perseus and SDR-IQ which use 14-bit ADCs, and the QS1R, NetSDR and Excalibur series which use 16-bit ADCs. Apart from a 30 MHz low pass filter, there is no band pass filtering. All the SDRs above except the Excalibur G31DDC have band pass filtering. If you buy an Afedri SDR-net you will accept some compromises, and you will need to do some mitigation measures. The question is of course: Is it worth it. The Afedri SDR-net is only the second amateur-grade SDR I know which can be connected to the PC via Ethernet, the other being the RF Space NetSDR which sells for USD 1400 (I consider the SDR-IP a commercial-grade SDR). Unlike the NetSDR though, the Afedri SDR-net can also use the more common USB connection. However, the USB connection limits the spectrum to 230 kHz (250 ksamples/s) while the Ethernet connection gives access to 1225 kHz (1333.33 ksamples/s). If you opt for the Ethernet connection (highly recommended), be sure to use a crossover Ethernet cable when you connect the SDR to the PC. A standard Ethernet cable should be used if you go via a router or a switch. There are two ways to power the SDR. There is a 12.6 VDC input in front (and a DC jack is included), however the DC voltage can be anywhere from 7.5 to 15 V. The problem with the DC input is that another compromise – a switching DC/DC converter working on 930 kHz – will reduce MW performance. My recommendation is to use the micro-USB input for DC power. If so, you can choose to use one of the PC’s USB ports, or you can modify the USB cable to power the SDR from an external, linear 5VDC supply. The USB connection draws 470 mA. This is close to the 500 mA limit of a USB port, so you may want to keep the cable as short as possible. Some laptops are reported to deliver less than 500 mA. As mentioned by Alex in a comment to this post, a root hub connector will deliver 500 mA, while other hub connectors may be limited in current. Hence, if you're unable to power up the Afedri SDR-net from one USB connector, it may help to try another. Sensitivity is an important issue for MW DX-ers in quiet areas. I measured around -91 dBm on AM, 6 kHz bandwidth with a 400 Hz tone modulated by 30 %. Internal gain from its Variable Gain Amplifier was set at 14 dB (see below). This is around 10 dB lower sensitivity than the NetSDR. Although sufficient for many purposes, the Afedri SDR-net will not resolve the weakest signals. A Norton push-pull preamplifier, from Kiwa or other manufacturers, will be helpful in many instances if signal levels are low. Another vital question related to sensitivity is: When does the ADC go into clipping? You can adjust the VGA gain of the Afedri from -10 dB to 35 dB. It is possible to tailor-suit the gain with the use of a small app inside the HDSDR program (which comes with the Afedri). Pushing it all the way up to 35 dB may not be a good idea unless you are certain that there are no strong signals around. In this setting, I got ADC overload by feeding one signal generator signal at -28 dBm signal outside of the received spectrum. Reducing the gain to 26 dB raised the overload threshold to -23 dBm, while at 14 dB the threshold came within a more acceptable -12 dBm. The G31DDC, also without bandpass filters, did not overload within the -8 dBm limit of my signal generator. Of course, one signal does not reflect "real life". The -91 dBm sensitivity was measured at 14 dB VGA gain. In theory, sensitivity could be higher, but rarely in practical terms (at 35 dB VGA, sensitivity was measured to -106 dBm, at 26 dB it was -104 dBm). Hence, external filtering will be necessary in most instances. A SW listener near strong MW stations will want a high pass filter to eliminate overload from MW. 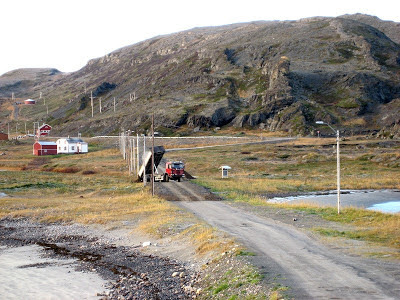 As for me, in many instances I can probably live with a 26 dB VGA setting, but I will invest in a low pass filter to eliminate the strongest SW station around here, Murmansk-5930. It is sometimes heard with signals above -10 dBm. It’s a bit too early to make conclusions about the Afedri SDR-net. 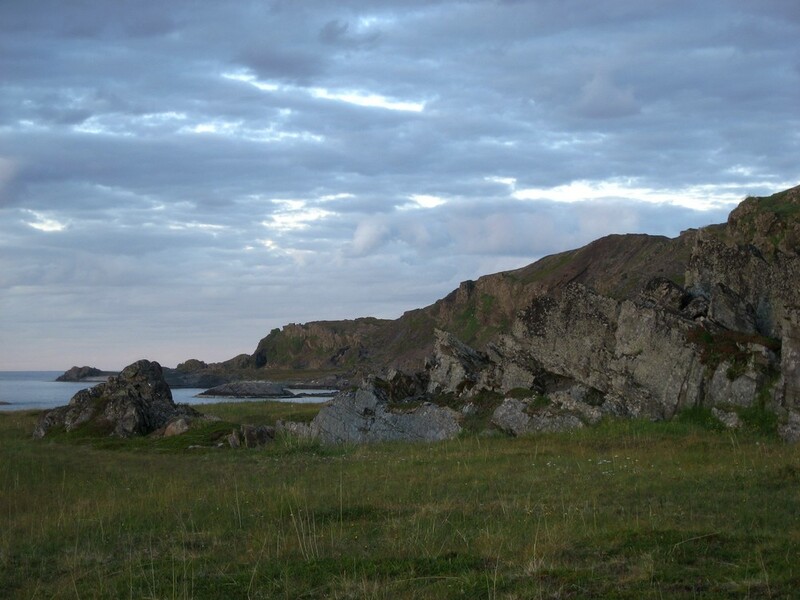 The Arctic nights are light, and signal levels low, making it difficult to judge how it will perform in real DX situations. My impression however, is that for the price it’s a very capable SDR, able to run with a variety of software. You should however buy or make high pass and/or low pass filters to avoid overloading the ADC. And you may need to use an external preamplifier if sensitivity becomes an issue. So, if you are willing to compromise: Yes, it's worth it. I thought the RF Space SDR-IQ was small, but that was until I saw the Afedri. The latter's footprint is actually smaller than the SDR-IQ's. For comparison, in the picture below it is sitting on top of the Perseus, itself not a mammoth radio. I haven't had time to much more than getting it up and going, so details will have to wait. It was very much plug and play, actually. I opted for powering it through its 5V USB connection, thus minimizing RFI. And I chose the ethernet connection rather than the bandwidth-restricted USB interface. Not only is it smaller than the SDR-IQ, it sells for half the price but still offers a 1250 kHz bandwidth compared to the SDR-IQ's 192 kHz. However, the USD 249 price tag suggests that the creator, Alex Trushkin, has had to make some compromises. Like a 12-bit ADC while other SDR makers use 14-bit or 16-bit, no bandpass filters, and somewhat restricted sensitivity. Still, my first impression is that it's a very cabable SDR, and basically unbeatable at this price level. You can buy a Norton push-pull preamplifier and lowpass and/or highpass filters and still have cash left compared to an SDR-IQ. And the SDR-IQ will not record 1250 kHz, and will not connect to the ethernet. The Afedri will run with many SDR programs, such as Winrad, Linrad and SDR-Radio. Many hobbyists design SDRs these days. The most promising I've seen so far is the AFEDRI SDR-Net, designed by 4Z5LV Alexander Trushkin. The latest version is not only able to cover the MW spectrum (1250 kHz bandwidth), but even has an ethernet connection! In other words, you can connect it to your router/switch, and access it with whatever PC is connected to your LAN. Just like the RF Space NetSDR. The specs aren't out of this world, but neither is the price tag. It will be interesting to see how well it fares compared to my other SDRs, Perseus, NetSDR, Excalibur and Excalibur Pro. I've just ordered one, and I hope to do some preliminary tests by the end of May. Thanks Tracey Gardner for alerting me. A good thing about Winradio's software is that you don't need the actual receiver. They load into a "Demo mode" if no receiver is connected. It is fully functional, and allows you to play back files without the receiver connected if you wish. I never seriously considered purchasing the G39DDC Excelsior, but I was keen to check out the software, since it would likely have some improvements over the G31 and G33 software packages. It was a mixed bag. The G39 software has many functions not found on the G31 and G33 software, mainly because it's supposed to support a scanner going up to 3.5 GHz. I had hoped to see a better designed playback function than those found on the G31 (mediocre) and G33 (improved). Indeed I did! The playback bar works very much like those found on the Perseus, Spectravue and SDR-Radio; you can click anywhere inside the bar and the recording will move to that spot instantly. Playing back a recording appears to be easier if you use the G39 software than if you use the G33 (and particularly the G31) software. However, there is still no way to make a small selection of the recording, and loop it. 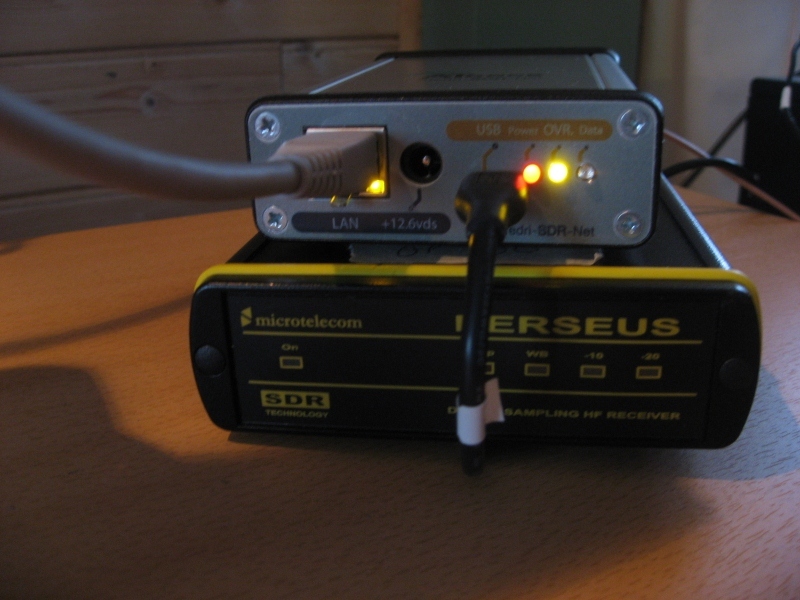 Both Perseus and SDR-Radio feature this very useful tool. The last four lines on the G39 control box expands/subtracts by use of the tool box to the right of the file path. Winradio G3x software has never been the easiest to use for those who want to check offsets from the nominal frequency. The G33 Demod window can be zoomed in to a width of 240 Hz. Maximizing the window enables the user to move in 1 Hz steps. However, the resolution is rather low so doing exact offset measurements isn't very easy. The G39 DDC2 window can only be zoomed to 500 Hz, but the resolution is better, so it is still possible to move in 1 Hz steps. Vertical lines on the display help a lot. 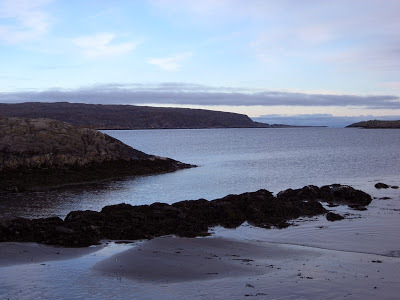 Today was my first visit to Kongsfjord in 2012! Checking antennas and replacing the QDFA battery was long overdue, with weather being the limiting factor. 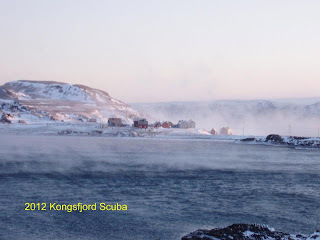 Last weekend saw temperatures down to -25 Celsius and winds up to 25 meters per second. The result is razor-sharp ice particles blowing around. You don't want to work outside in conditions like that. 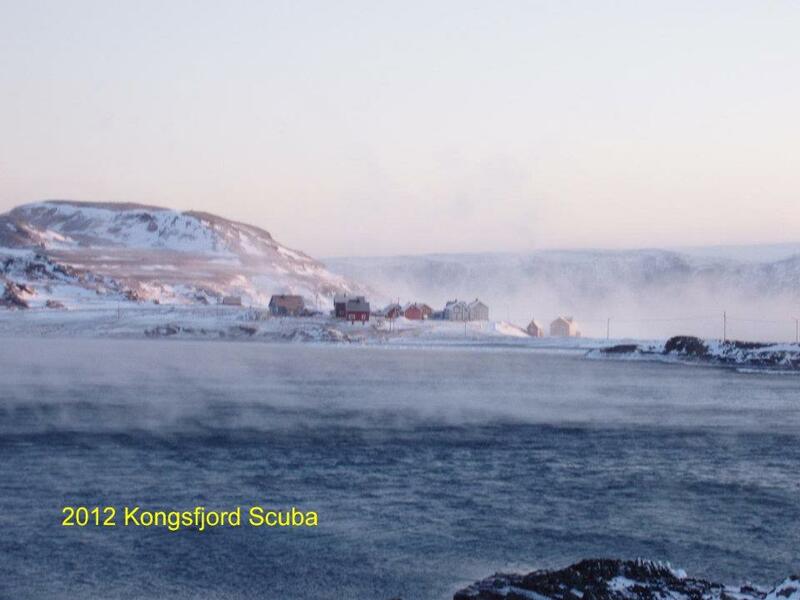 The picture below from Kongsfjord International Scuba School (copyright) should illustrate my point. My house is just outside the left frame. Today though was mild and relatively calm, allowing me to replace the last beverage lamp cord feedline with a Belden Twinax. Works fine. The QDFA inspection was rather disappointing. 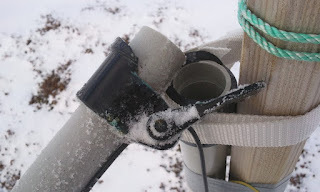 One of the clamps securing the secondary fiber glass rods had snapped, probably as a result of the temperature and wind. Also, two of the loop wires had snapped, probably of the same reason. Lesson learned is that we need more durable wires for our QDFA. And another example of the mechanical challenges loop arrays are in areas with extreme weather conditions and without being able to look after the array on a daily basis. But we live and learn! Maybe next season the QDFA will be operational all winter!